LCAC1675174 has been unleashed upon the public, again. Despite earlier indications, Miss Debbie will neither face a trial nor more charges. according to Lane County Jail records. 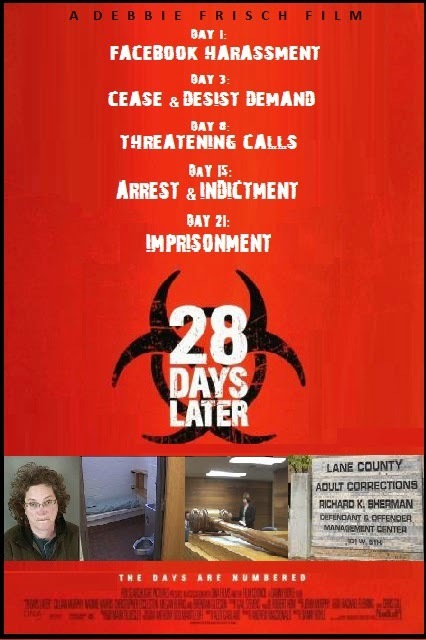 "WHAT I SAW AT THE HEARING"
Lane County Courthouse, 8th and Oak, Eugene, Oregon 2:25 p.m.
and opened the door to shout, "Courtoom 201 is open for 35-day call!" ...and Had a Lawyer Named "Deal"
"Please be sure your cell phones are on silent and put away." present; those absent were granted recalls or had warrants issued for their arrest. were issued for no-shows; no one was taken into custody. Overheard: Did Deal make a Deal? "They can keep the mentally ill locked up for three years," one said. "I'm afraid that's what's happening," said another. professional attire chat amongst themselves. questioned by a white-shirted female Sheriff. Suddenly Ms. Frisch was ushered in, along with two male defendants in custody. issued short-sleeved shirt, with matching green slacks. the witness stand, keeping a vigilant yet friendly eye on the two male inmates. with Ms. Frisch, then left the room. "Ms. Frisch, please turn around. Their conversation does not concern you!" ordered a female Sheriff in white. 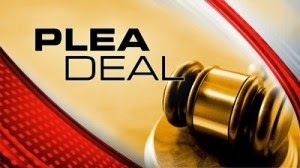 "My client would like to speak with the judge," said Mr. Deal to the prosecutor. Mr. Deal approached the clerk. It was easy to overhear: a plea-deal was in the works. discuss inmates and conditions at local jails. And so on. In the tedium, eyes glaze over. The female Sheriff, I realized, must have been there to keep a clear eye on Ms. Frisch. In reality: Two male inmates joked with the young male Sheriff at the witness stand. "That's a good one!" Frisch laughed, overhearing a fart-joke. More suits rolled in. Mr. Deal sat next to Deb in the jury-box. They conferred. State of Oregon vs. Frisch. Lawyers' fees were waived; Frisch's prison-sentence was declared "time served." criminal sentence in 2009 and probation-violation sentence in 2010. By a longshot. right to be found guilty against a reasonable doubt?" "I understand that," Frisch barked. The judge then requested the facts of the allegation. Sheriffs "in a state of anger and emotion," was false. Ms. Frisch was asked by the judge whether she wished to make a statement. The judge delivered her sentence, in keeping wth the plea deal. Frisch's freedom was at hand. for a welcome taste of refreshing spring air. "How could Frisch just walk away?!" future actions, Trix E. Lom cannot help but echo his concern: How, indeed? 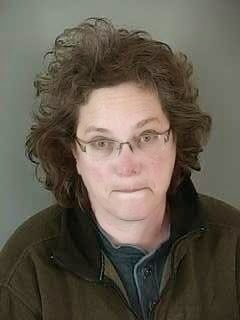 Eugene, OR (March 30): Deborah Ellen Frisch faces a judge Monday for a 35-Day Call hearing in connection with her arrest Feb. 19 on 3 counts of stalking and 1 count of filing a false report. Frisch has remained jailed, in lieu of bail, since her arrest. Request a set over, which gives them more time to figure out what to do with the case"
scheduled to be held in Room 201 of teh Lane County Courthouse. Deb Frisch Court Calender gives Debbie Tax-Day Trial!